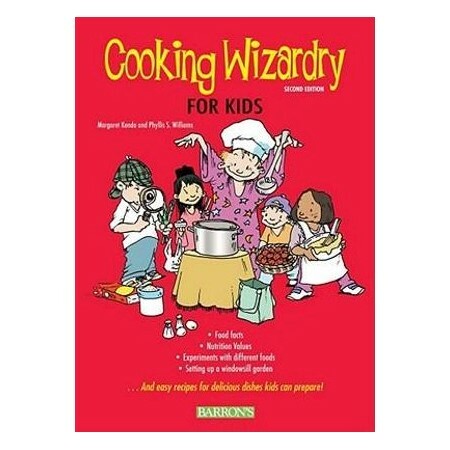 Restyled, filled with attractive new color illustrations, and featuring nearly 200 recipes for wholesome, fun-to-prepare treats, this brand-new edition of Cooking Wizardry for Kids also features interesting facts about food and food sources, nutrition values, and psychology experiments that demonstrate how many foods' colors and temperatures affect our ideas about their taste. Recipes easy enough for kids to follow include strawberry shortcake, tasty pita pockets, Chinese egg rolls, pad Thai, and many more. Many of the new and easy recipes in this edition emphasize international taste treats. Kids will also discover what makes breads and cakes rise, and they'll find instructions and inspiration for growing herbs and vegetables, even in a small or indoor space. Margaret Kenda is a writer specializing in creative, hands-on projects for children. Her books' subjects include science, math, geography, inventions, language, and cooking. She is a graduate of Northwestern University and holds a doctorate from the University of Iowa. She lives in Sudbury, Massachusetts. Phyllis S. William is the original co-author of Barron's Wizardry for Kids books. A graduate of Bates College and the University of Maine, she is a retired nurse and counselor. She lives in Bangor, Maine.